Effective short range for personal defense. 8-10 inch penetration. Features distinctive black hull. Highly effective in both shotguns and 410 compatible handguns. Contains 4 plated defense disc projectiles over 16 plated BBs. Combo pack for personal defense. 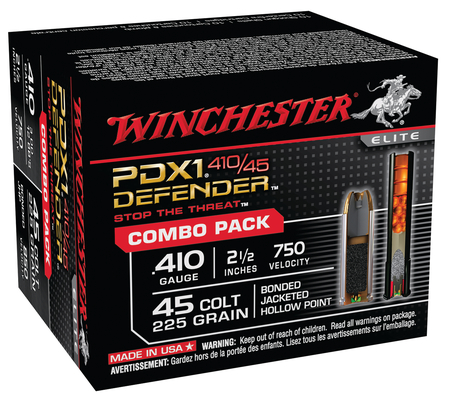 Includes 10 rounds of PDX1Defender .45 Colt ammunition (225 gr.) and 10 rounds of PDX1 Defender .410 2 Â½ inch for a total of 20 rounds per box. 10 boxes per case.